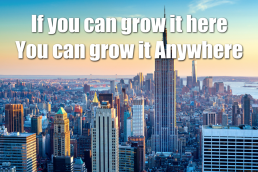 A beautiful quote straight from New York, the Mekka of Urban and Vertical Farming. A quote by Henry Gordon-Smith, founder and Managing director of Agritecture Consulting. Henry has been in the Vertical Farming Movement for many years and has done A LOT of things. He co-founded the Association for vertical farming and Agtech X, He is advisor at Huxley, mentor at square roots and a board member of teens for food justice,…and there’s probably 80 other things that we have not mentioned here. Needless to say, he’s one of the leading experts when it comes to Urban and vertical farming. Founded in 2014, Agritecture Consulting (formerly Blue Planet Consulting) provides advisory services in the design, planning, implementation and operation of urban agriculture projects. They offer the tools, data, ideas, network, and expertise needed to ensure success in Urban Farming projects. They consult globally and are based in New York City. Their vision is to create a world where commercial urban agriculture is economically feasible, reduces the carbon impact of the food system, and improves food security. Agritecture Consulting has started up many different Urban Farming and Vertical Farming projects. Which means that they have an enormous amount of interesting insights on the 12 steps of many different project all around the world. Let them consult you on your project via an in depth interview with Henry Gordon Smith.